The rest of the memory is especially unclear (not unlike the crappy image above), but I remember darkness, flashing lights, and somehow curling into the fetal position on the floor of the roller-coaster car. Still, while everything else might be extremely hazy, this part of my memory isn’t: it was terrifying. Ten years later, I went to Six Flags Magic Mountain with some friends in high school. I hadn’t been on a ride in many years. Our “warm-up” ride was this giant pirate ship that just swung back and forth, going higher and higher. Apparently, the look on my blood-drained face made my dismay transparent to my friends; although I tried to play it cool while exiting the ride, I didn’t escape their ridicule so easily. And while I could have quickly put an end to their taunts by simply hopping onto the next ride with them, I ended my day there. I didn’t go on another ride. Honestly, that short, three-minute event was one of the most harrowing experiences of my life, which says volumes about the sheltered life I’ve lived and the irrationality of my fear. For a while, I couldn’t figure out why that silly pirate-ship ride had been so debilitating, especially since I had been skateboarding for years and was rarely afraid of charging up and down ramps, stairs, handrails, or any other obstacles. I didn’t mind falling or getting hurt. I had broken bones, had suffered countless scrapes and bumps and bruises. I had never been afraid of heights. In my attempt to figure out the root of my phobia, I started to think back to my trip to Disneyland, conjuring up these memories I hadn’t examined in years. And that’s, of course, when I remembered the Space Mountain excursion. The only thing is, I don’t believe it really happened. I spoke with my father recently, asking him if he remembers this incident, and he insisted it never occurred. Or, at least, he doesn’t remember it. My own memory of this experience is so spotty that I have a hard time believing its validity myself. And there are certain details that seem fishy. First of all, I wouldn’t have been able to crawl into the fetal position on the ride—I would’ve been strapped into my seat. Rather than reflecting reality, this part of the memory might be a construction reflecting my desire to crawl into the fetal position. But that makes me question the rest of the memory. Did anyone actually talk me into going on the ride? Was my dad involved at all? Perhaps it was my uncle? A cousin? And do they even let five-year-olds ride Space Mountain? Or is it possible that this entire memory is a fabrication, a way of rationalizing an irrational fear? While I know that most of us repress memories that are too painful to deal with, how often do we create entire memories simply to explain the unexplainable, to make our current realities seem more plausible, more understandable, more connected to our pasts? I like thinking of my life as a narrative, with a seamlessly linked beginning and middle (though without an end, since of course I plan on living forever); yet, reconstructing that narrative is getting increasingly frustrating, as the connections between my past and present become more and more drawn out, more and more disconnected. It doesn’t seem worthwhile, going to such lengths to overcome my phobia. And I don’t really mind it so much, as long as I have some rationale to explain my fear, however dubious the memory on which it is based. I’m not at all being condescending when I say that having a phobia of roller coasters is on par with disliking pizza or TV, in terms of perhaps psychologically crippling a childhood. My life partner shares your (ir? )rational fear, Jeremy, and it’s frustrating to realize I will never be able to hold hands with him on Medusa at Six Flags Great Adventure (best. coaster. ever.). Do you guys at least get special parking privileges?? Jeremy, I like this post. It’s quite brave. Did you consider perhaps the title: My Gay Secret, Part 3.? Seems perfect. I took the Space Mountain ride in 1978 as a 10-year-old visiting from England. It was exactly as you describe, except I loved it! However, my fears have increased dramatically with age. I can no longer go on any of those amusement rides that involve gravity fighting with my brain and stomach. I do have a theory that these kinds of rides are not for Type As or control freaks and yes, I’m outing myself here. Complete loss of control is just not amusing. Jeremy, I share your fear of amusement park rides. Occasionally I’ve had what might be termed an okay time on one or two of them, but it generally doesn’t compensate for the utter terror I experience. A couple months ago, Jen and I took her niece on a Ferris wheel at Boomers! in Fountain Valley. (New Yorkers and others, just picture your worst nightmare vision of SoCal – no fountain, no valley, just freeways, mini-malls, and tract housing.) I very nearly suffered a panic attack while Julia (3 yrs.) screamed with delight as the device of my torment twirled us in the air at the dizzying speed of 15 mph. Jen was similarly affected, but not nearly to the extent I was. I have never felt the need to seek (or partially invent) a narrative or ‘spot of time’ to explain this fear. There are many rational explanations, I’m sure, each of which I could have at the ready for different audiences. E.g., to you who have been through med school I could say, “My system has an averse reaction to adrenaline.” But these would merely be temporary rhetorical tactics. In the end, it’s not really a fear that I feel the need to overcome. Luckily for me, Jen feels the same way. Oh, my god. As a fellow amusement-o-phobe, I hardly know where to begin. 1. In 3rd grade, my brother and mom went on a “bullet” ride, a capsule that rotated while going around in a big circle, that made her sick. This planted the fear in me. 2. In 4th grade, at Carowinds in South Carolina, several laughing “friends” dragged me screaming toward the Scooby-Doo children’s roller coaster. I managed to bite someone and run away. 3. In college, I decided I couldn’t face myself anymore if I was too chicken to go just once on a roller coaster. I chose the “Scream Machine” at Six Flags over Georgia, on a rainy day. It was a rickety old wooden roller coaster, scary as hell just to look at. I went on it once, gritting my teeth the whole way, and was miserable. My friend who was with me insisted I try again, but this time screaming like I was in a cheap slasher flick from beginning to end. I did. It was actually… kind of… fun. But not fun enough to ever do it again. 4. I was scared of squirrels too, after I idly asked my mom if they could bite. Yes. Could they make you bleed? Yes. Could they make Dad bleed? Yes. The next time I saw a squirrel, I stood rooted to my spot, staring in horror. So did the squirrel. The standoff lasted a good 20 minutes, until I finally turned and sprinted home on shaky legs, never daring to look back. i’m type-A and a bit of a control freak but i love to let go on a good ride. i love love love coney island — the creaky old wooden cyclone, the rides that spin you upside down. the only one i don’t like is that big viking ship, because you really do feel like you’re going to fall off. anything else goes. i haven’t been to a lot of highpower 6 flags stuff, but i can imagine liking them just fine. i’ll be happy to take that trip with you sometime g-lock. When I first saw the photo of Space Mtn., I knew it reminded me of something. Now I remember: Bruegel’s “Tower of Babel”. 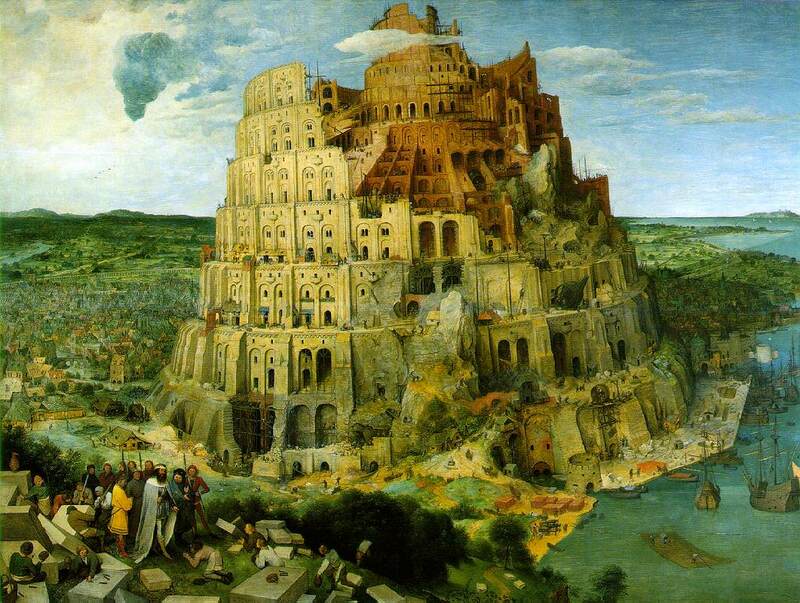 Like the kids say, check it out: http://www.ibiblio.org/wm/paint/auth/bruegel/babel.jpg. My deepest fears are rooted in Disneyland. As a So.Cal. kid, I got dragged there several times a year, when relatives came to visit. Space Mountain IS scary, and it’s not comparable to other roller coasters, because it’s pitch black. You don’t what is happening, or when it going to happen again. In the late 70s, when it opened up, there was a lot of poublicity about how “dangerous” the ride was, and the warnings leading up to the ride were more ominous than anything I had ever seen before–even more alarming than the SCARY printed next to Mr. Toad’s Wild Ride and Snow White’s Tumbler of Terror, or whatever they called that ride that STILL FREAKS ME OUT, on the old E-tickets. So it’s quite possible that your experience is all mixed up with a huge amount of publicity and concern over this new and controversial ride. But what about the Matterhorn? As if a roller coaster isn’t scary enough, there’s a giant monster screaming at you ever third turn or so. I think it’s the insistence on narrativizing every ride that makes Disneyland so sinister. Just strap me into a ride and whirl me around, I don’t mind. But don’t make me believe I’m actually heading into space, or up a frozen mountain, or into the desert in a broken-down out-of-control locomotive. The ride that totally undid me was The Haunted Mansion–that part in the beginning when you think you are standing in a room, but it’s really an elevator and the pictures on the walls get longer and longer until you see that what appeared to be a pretty lady with an umbrella is really a pretty lady poised over the mouth of a gigantic alligator, scared me to death and I remember trying to bury my face in my father’s legs and being spanked, turned back around, and told to “face my fears.” Same thing each time we walked by the horrible concrete whale with the huge gaping mouth that you actually have to enter on one of the boat rides. Way. Too. Scary. I still can’t walk by that whale without shuddering. Magical Kingdom=sadistic land of terrors. When I was about 9 or 10 we visited Disneyland. I didn’t know what to expect with Space Mountain; I guess I was kind of nervous, but willing to give it a try. But I was totallly unprepared for how disorienting it was — totally dark except for randomly flashing lights, and the G-forces were jerking me around so much I didn’t know which way was up. Terrifying. Of course, my dad and my younger brother, and our two friends and their dad who had come on the trip with us, loved it. So when they did the ride again (and again) on the second day of our visit, I had to stick with the moms and the younger girls — I think we went on Mr. Toad’s not-so-Wild Ride, which was not scary at all, even to me. The Matterhorn I liked — just scary enough, and you could actually tell up from down. On a trip to Disneyland in college (celebrating a friend’s marriage in San Diego), my friend Ed was terrified of the log ride, the one that involves two near free falls down waterfalls in a giant log/boat. He actually agreed to go on the ride at the end of the day, but as the log was slowly being pulled up the slope for the first drop he got increasingly agitated. About two-thirds of the way up the slope he turned to me, said “I’ll meet you at the exit,” took off his seatbelt, and stepped out onto a staircase that ran parallel with the flue we were traveling. He eventually found his way out through the bowels of the ride and we will never stop mocking him for it. I too was reminded of something by the space mountain photo, but it was another site in CA: . But I make such connections; I live in Stupidistan . Hmmm. Links in above post not showing. Great post — I likewise had a serious fear of roller coasters triggered by a similar vividly-remembered childhood episode (getting separated from my uncle and riding the coaster in Vancouver alone, not fully strapped in). Fortunately the phobia passed and I now love roller coasters (but hate vomity tilt-a-whirls), although it’ll be years before I can indulge again since my partner is too chicken and my daughter is too young. Anyway your post has me wondering if the childhood episode actually occurred — now I bet my uncle wasn’t even around, and the whole thing was a trick played by my subconscious…. Sometime after I started writing that post, I realized I wouldn’t have time to do the topic justice. So, I’m pleased by all the comments here, since I think they flesh out the fear-of-rides issue more fully. What I didn’t realize is that the post would hit this tender collective nerve. I agree, Shar, about the loss-of-control issue. It’s the same reason why I have a hard time being a passenger in a car. What interests me about some of the responses here, though, are the references to the horrifying imagery of amusement parks (Disney’s haunted mansion, which Missy mentioned, was terifying for me too… and I remember being similarly freaked out by Pirates of the Carribean), since I wasn’t really thinking about that when I wrote this–and I think that would make a fascinating post. For the record, I’m not sure why I thought the Space Mt. facade was “benign”–the more I look at it, the more forbidding it seems. And squirrels… our campus is infested. Everyone else thinks they’re cute, but they move too quickly, are always skittering around in the trees overhead, and they’re not afraid of people. The other day, just as I was walking by, one jumped out of a trash can at me, an entire muffin in its mouth. I’m pretty sure it had the plague, too. jeremy, i’ll hold your hand on space mountain this summer if you think it would help. Jeremy, I must clarify that I’m not afraid of squirrels anymore. Except for one that chased me across 15th Street a year or so ago with a rabid, murderous look in its beady eyes. That one, scary. The rest of them, OK.
Well, I am going to take you back in years. Back to when nobody ever heard of Monsanto, who is now genetically engineering our food. Furniture was made of wood and stuffing not plastic. That year Disneyland opened, everybody knew that Monsanto was a household world, they brought us the world of Tomorrow. Tomorrow Land. Skip ahead a few years and I guess I was about 11 or so and a memory of a private trip to disneyland with my father. Everybody was ushered into the Presidential Hall of Fame, which had just opened up. The tech is amazing and I have not seen robotics duplicated though we are talking about 60’s technology. After watching the grown-ups watch the robotic performance, we were ushers down a hallway overlooking a planned out scheme of what ‘Disney World’ in Florida would one day become. I again watched the eyes of the grown-ups, pretty mesmerized. Did it ever occur to you what a ‘way easier way’ to insight mind control than an atmosphere of noise and sound coinciding with subliminal messages interspersed through certain ride experiences. I am not saying ‘all rides’ in the park but certain ones. Just would love to raise the suggestion as perhaps in this sort of a format, there might be some that might have an inkling of an idea to the possibility.